Have you ever faced nausea-like symptoms especially when you sleep late due to some work assignment and get up early the next day and to rush to work? You can get rid of this symptom by mixing half an inch ginger and half a lemon in warm water. Not only will this magical ingredient relieve your nausea-like symptoms, but it will kill the harmful bacteria in your gut, thus keeping your gut in a healthy state. Are you suffering from any kind of heart disease or a high cholesterol level? If so, you can consume this lovely ingredient in many ways which will help lower the bad cholesterol in your heart. You can add it while tempering your food or vegetables or simply add it to your green tea. It helps lower the bad fat levels in the body like very low density lipoprotein, which accumulates harmful cholesterol in the arteries thus preventing atherosclerosis. Many weight loss products in the market out there contain ginger as a weight loss ingredient especially garcinia cambogia extract which aids in weight loss. This is because this magical ingredient helps in breaking the fat cells of your body and thus helps you regulate your normal body weight. It contains certain bioactive compounds that break harmful fat cells in the body. If you or any of your close ones suffer from cancer, do not forget to add ginger in your diet as this ingredient has various benefits as they kill the harmful cancerous cells inhibiting their promotion and progression in your body. Cancer patients can add ginger along with vegetables in cooked form. Ensure that it is not consumed raw with smoothies as cancer patients need to follow a neutropenic diet and not contract any kind of infection due to it. When individuals who are not used to exercising suddenly hit the gym, they might face severe muscle soreness the next day. This can definitely be prevented by consuming either green tea or black tea with ginger pre-workout which might help you alleviate these muscle soreness symptoms the next day. If you ever contract cold or fever, use this lovely ingredient which is easily available in everyone's household. 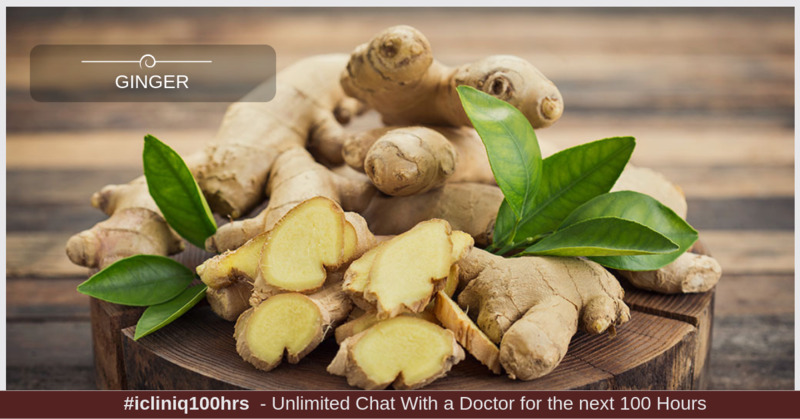 Ginger has certain bioactive compounds which help treat cold and fever. You can add one-inch ginger and have it with warm water. Add in some mint leaves too to see more positive results. There is no need to opt for medicines when you have natural ayurvedic ingredients available right in your house. I hope you loved reading this article and would definitely incorporate ginger in your diet for its awesome benefits to your health. Do you have a question on Green Tea or Nausea?